Venue says A modern, stylish and vibrant ‘grand café’ with a passion for traditional Belgian beer and cuisine at its heart. Brightly logoed and Benelux-themed, the smart Lowlander’s expansive, long-tabled main space is easily filled, thanks to an impressive range of draught and bottled beers, a fine kitchen and likeable staff who are well up to what is, given the bar’s popularity, often a tough job. Some 15 tap beers, by the half-pint glass or two-pint jug, include Palm Spéciale, St Louis Premium and Poperings Hommelbier, as well as more familiar compatriots. Of the 100 bottled varieties, Achel, Charles Quint and St Feuillien Blond stand out among the 20 abbey types – and you won’t see a lambic Cantillon Rose de Gambrinus in many bars even in Belgium. The own-made Stoemp stew, meanwhile, is ubiquitous there, while mussels come in a choice of four sauces. The attractive mezzanine is often occupied by private parties. I've tried their Belgian waffle, which was very tasty. A crispy waffle piled with cream, chocolate and strawberries – you cannot go wrong! Also enjoyed the little signs and prints around the pub, which nod back to vintage Belgian signage and design. Nice place for a casual work lunch. Love love love this pub. It's close to all the hustle and bustle of Covent Garden but yet never so busy you dread walking in for fear of being crushed. Of course they have amazing beers to try, and the other day we actually ate lunch there. I had the Croque Monsieur and oh my. So deliciously decadent. Must try. The waitress, although it was a tad busy, never rushed us and was very friendly. Great place to come for a beer or a meal. Oh and try the bitterballen. You won't regret it. 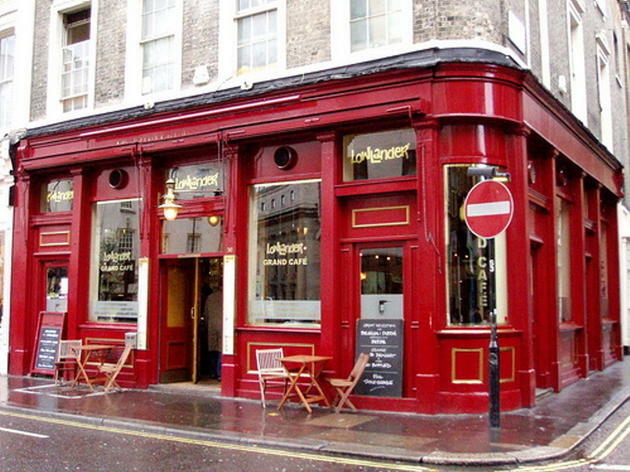 Slap bang in between Holborn and Covent Garden, this casual beer haven is the perfect place for after work drinks. Service is speedy and friendly, the interiors are really cool Belgian style and the selection of beers is awesome! Worth a visit. I am from Dunkirk, which is just at the frontier with Belgium. So I am a big fan of Trappist beers and I always love my mussels and fries. But since I moved to the UK, I only knew Belgo, and I was pretty disappointed. Until I discovered Lowlander. This pub has the typical decoration from bars in Belgium. Above all, they serve all Belgian beers including my favourite: the Karmelieet. Santé! Been here a few times, quite enjoy the atmosphere and space, and the real draw - the beer list. Lowlander boasts a multitude of beers, Belgian specialities, which the bar staff were happy to let me try until I found a favorite - very nice! The food pairs nicely with the beer. I had a mussels and chips - Belgian classic. Not the best mussels I've had ever or in London, but pretty damn tasty. Weirdly, on the side there was this ciabatta bread and it was incredibly delicious (more than the mussels! ), so much so that I asked for another piece! The only downside to this place is the cost. Two pints were £13 - which even for London is pretty outrageous. They were delicious, but over 5 pounds a pint - there better be gold flakes in my pint for that! Anyways, amazing beer list, incredibly priced. Brussels might be only a couple of hours train ride from London, but I definitely won't be the one complaining about having a Belgium bar in the heart of the UK capital! Lowlander is my favourite meet up point for an evening get-together in Covent Garden, thanks to their impressive selection of Belgian beers, simple, but delicious meals and lively atmosphere. Great choice for pre-theatre drinks too! 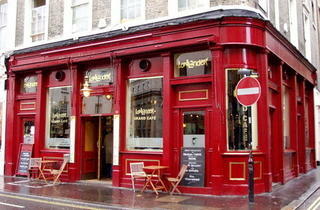 If you are looking for somewhere a bit kitsch yet cosy and full of good beer- look no further as Lowlander is for you! I dined with a table of 12 on a Saturday afternoon where there is a buzzing atmosphere but not too busy to affect service. Be prepared to take a lot longer than usual to order your drink; the beer selection at Lowlander is vast, I mean Bible worthy and cover a range of tastes, making processes and countries of origin. Once you have managed to quench your thirst, then you can move onto the food.The Moules Mariniere is a standout dish, delicious and tender in a creamy, rich sauce served with double fried chips and bread, just in case you don't have enough carb with the chips to soak up the saucy goodness. Other tasty dishes include the chicken schnitzel (a classic) and the pork belly, which is melt in the mouth with a salty crackling top- beautifully cooked. Only reason I docked a star is that the beers are quite pricey, although you expect if for their alcohol content and originality. Definitely worth a trip for something a bit quirky in the theatre district. An attractive bar with friendly staff who really know their beers! The food we tried was good quality and tasty. We contacted the bar the day before to request a vegan meal and this was accommodated. It's usually buzzing in the evening and the only downsides are 1) due to the open space and big glass windows, it gets really quite noisy and 2) the quite rigid booking times (6pm or 7.15pm). But well worth a try... you don't even have to like beer. Great bar. Long wait. But well worth it. Large selection of beers and I mean large.